"Anne Patterson is a multi-disciplinary artist based in New York City." Anne Patterson is a multi-disciplinary artist based in New York City. 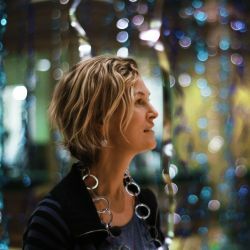 Her body of work consists of paintings, sculptures and large-scale multimedia installations that combine sculpture, architecture, lighting, video, music and scent. Anne’s large-scale installations have filled cathedrals, office buildings, and galleries across the country with miles of fabric, aluminum ribbon, and metal birds. She created Graced With Light, an installation inspired by music, as the 2013 Artist-in-Residence at Grace Cathedral in San Francisco. Twenty miles of ribbon interacted with the cathedral's vaulted ceiling arches, carrying visitors’ prayers, dreams, and wishes skyward. Immensely popular, Graced With Light was extended four times and on display for almost two years. The work was also an Instagram hit, garnering over half a million “likes”. Permanently installed in 125 High St in Boston in 2015, The Light Between fills the 10-story atrium with multi-colored, reflective aluminum wire. In 2016 her synesthetic, interactive installation Pathless Woods was experienced by over 300,000 visitors at The Ringling Museum in Sarasota, FL. In May of 2017 her installation Murmuration was unveiled to celebrate the 200th anniversary of Christ Church Cathedral in Cincinnati. Anne’s installation Another Sky, also created in 2017, filled the Waterfall Atrium in The Venetian Las Vegas with 32 miles of cascading blue ribbon. Anne’s theatrical and symphonic partnerships have included major venues across the United States: Lincoln Center, Brooklyn Academy of Music, Arena Stage, The Wilma Theater, The Kennedy Center, Alliance Theater and prestigious symphonies throughout the country (San Francisco, Atlanta, Philadelphia, Chicago, Seattle). Anne’s fine art has been exhibited in New York City; Providence, RI; Atlanta, GA; Sarasota, FL and Seville, Spain. Her paintings and sculptures are in private, public, and corporate collections across the USA (Tishman Speyer, Tribune Media, Nortek, New York Presbyterian Hospital, Memorial Sloan Kettering Hospital, Rhode Island Blue Cross) and in London. Patterson received the 2016 CODAaward Winner for Liturgical Art and was awarded a Creative Capital Grant from the Warhol Foundation. She is a fellow of the Hermitage Artist’s Retreat, and has been a visiting professor at Carnegie Mellon University. Education - B.A. Architecture, Yale University M.F.A., Theater Design, The Slade School of Art, London UK.